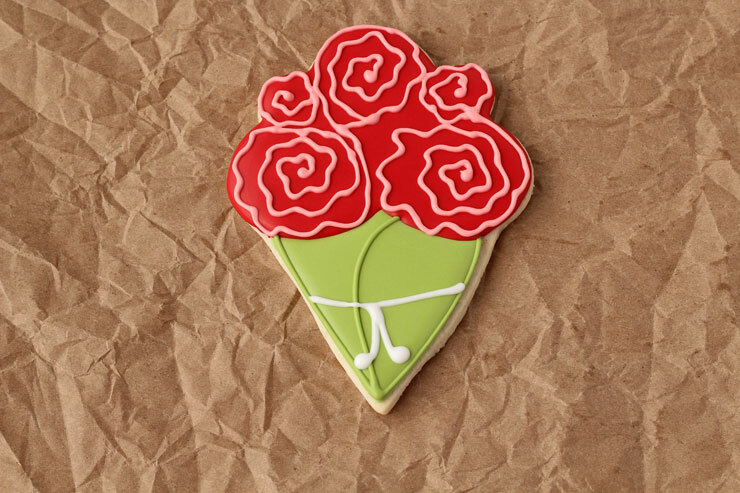 Spring is in the air and flower cookies are popping up all over the web. 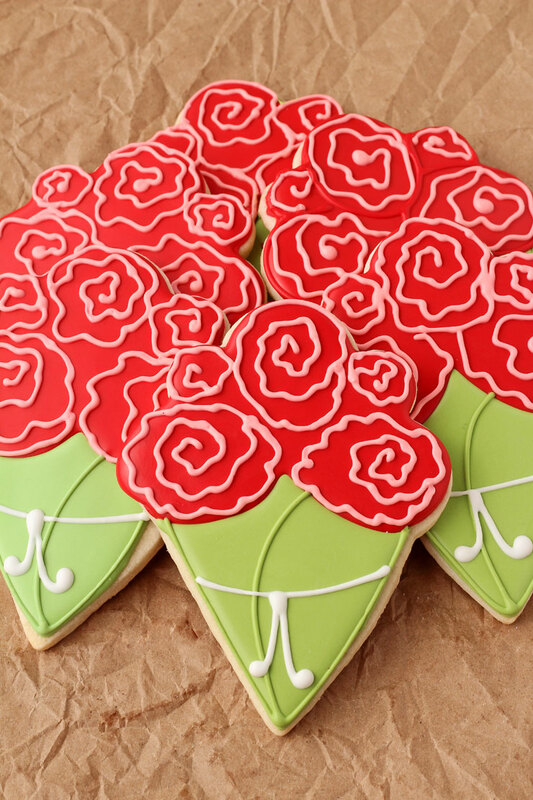 If you look at Pinterest you will see a ton of flower and flower bouquet cookies. 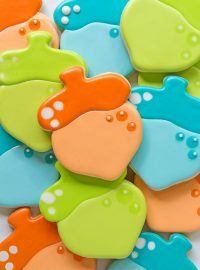 There are beautiful cookies in all shapes, sizes and colors. 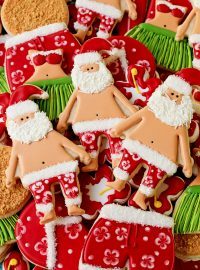 The best part is they are made with so many different cookie cutters that inspiration is jumping off the computer screen. I have been planning on making flower bouquet cookies for quite some time and had my flower bouquet cutter picked out. 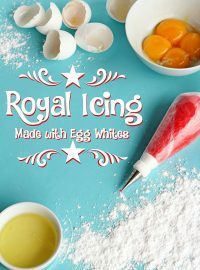 After spending some time on Pinterest I decided it was time to join in fun and make for you today. 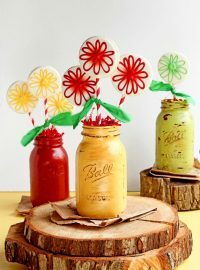 Before you read any more of this tutorial, can you tell what cookie cutter I used to make these flower bouquet cookies? Keep reading to find out. I bet you already have this cookie cutter at your house. Do you see it? Just for the record, this is my new favorite color of green. It is AmeriColor Avacado mixed with Electric Green. 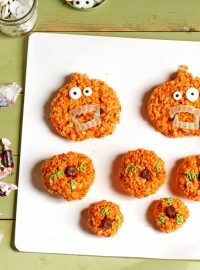 I can’ t wait to make Halloween Cookies. I think it will give Frankenstein a nice glow. 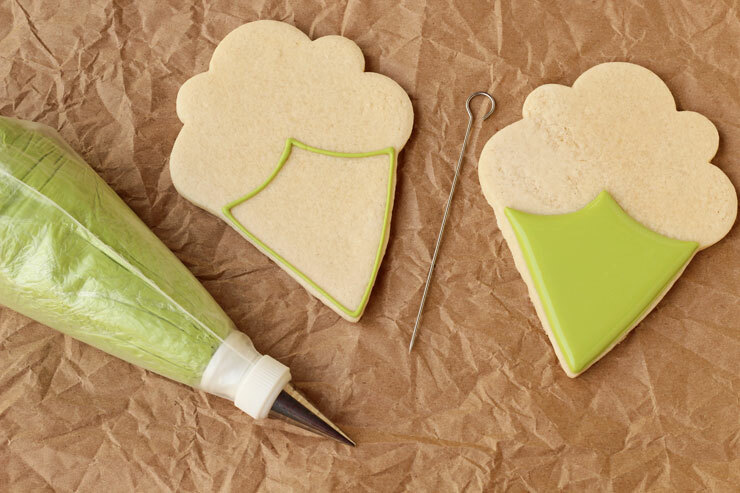 Begin by outlining and flooding the bottom of the cookie with the green icing. Let it dry for about ten minutes. Next, add the green detail and let it dry overnight. 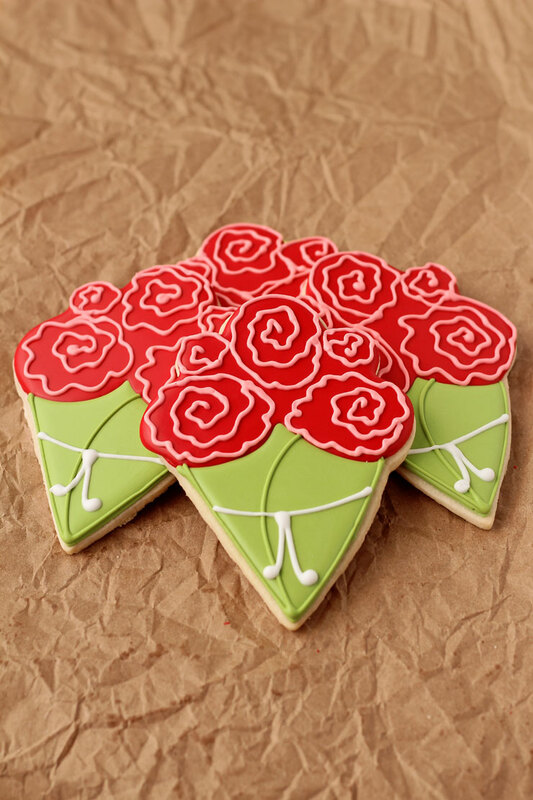 Once the green icing is dry, outline and flood the flower area with red icing and let it dry for at least ten minutes. 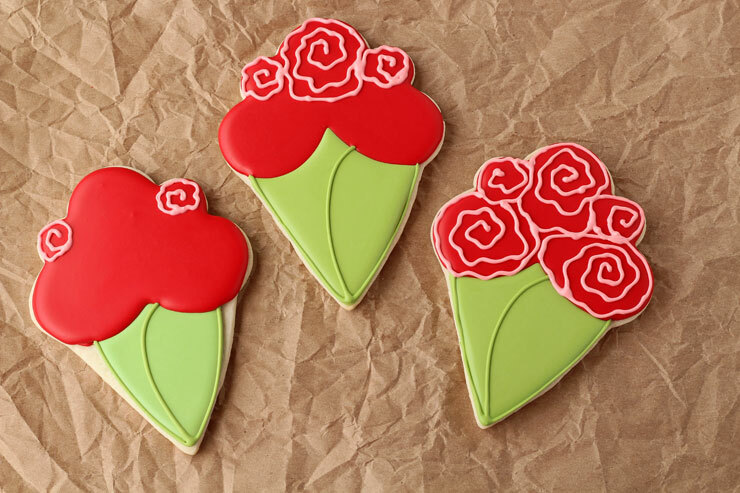 You can use any color you want but I felt like using red after seeing these cookies Rose Cookies by Sweet Sugar Belle. As a matter of fact, I was planning on doing a simple swirl in the center of these cookies until I saw her video and how she made the wonky centers. That was all it took to make me change my design a bit. Her amazing talent and wicked mad skills has changed the way I see rose cookies forever. Thanks Callye! Now it is time for the fun pink wonky centers. 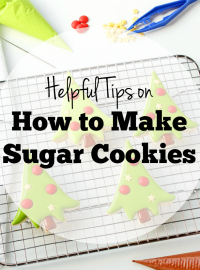 Watch Sweet Sugar Belle’s video and she will show you exactly how to make them. The only difference is on this cookie, you need to make several roses. The best way it to start with the small roses on the sides and then make the bigger roses. The only tip you need it to be carful and don’t overwork them. The first one I made had some major swirls going on. It was very crowded and looked more like a crazy spider web then a rose bouquet. So keep in mind that simple is better or in this case less is more. Next, add a little white line to make it look like bouquet is safe and secure and won’t fall apart as soon as you pick it up. I hope you are enjoying spring and are getting a chance to get out in nature and enjoy the gorgeous spring flowers. If you are stuck inside, I have started a Pinterest Flower Cookie board you might enjoy. There isn’t much on there right now but just wait. I am a pinning machine and will have flower pictures popping up faster than the weeds in your garden. So follow me for Pinterest fun. Love these. Love those colors together, too! GORGEOUS! I cannot wait to make these! 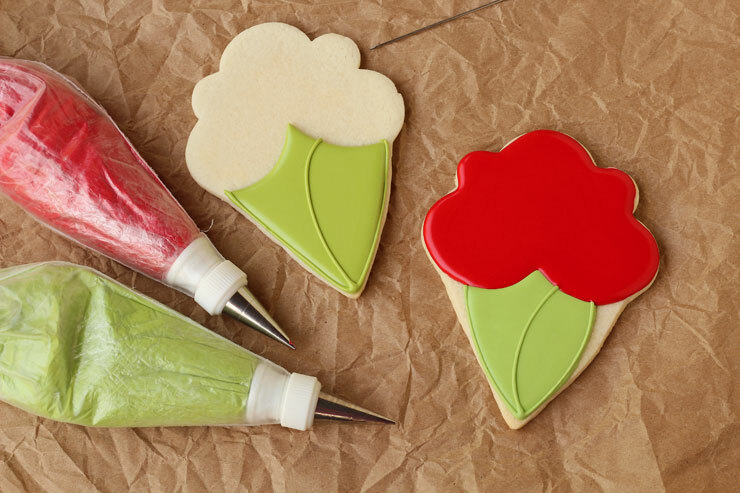 These are so pretty – great use of the ice cream cutter!